In 2013, Israel, Jordan and Palestine signed an agreement on a project to replenish the rapidly shrinking Sea by transferring in water from the Red Sea along a 110-mile pipeline, in a region where distribution of water is a contentious issue. The Dead Sea has shrunk by 30 percent in the past two decades. In 2013, Israel, Jordan and Palestine signed an agreement on an ambitious and contested project to replenish the rapidly shrinking Sea by transferring in water from the Red Sea along a 110-mile pipeline (1). The proposed pipeline known as the Red Sea-Dead Sea Water Conveyance Project (Red-Dead), is meant to help to slow the dessication of the Dead Sea and provide water for Jordanians, Israelis and Palestinians (3). Under the agreement, 300 million cubic metres of water will be pumped each year under the first phase. In its following phases, the Red-Dead project will see the transfer of up to 2 billion cubic metres of sea water from the Red Sea to the Dead Sea (3). Analysts have critiqued the project on the basis that it would provide only 10 percent of the volume of water needed to stabilise the Dead Sea, while threatening its unique characteristics, and would not alleviate severe water shortages in the area (1). 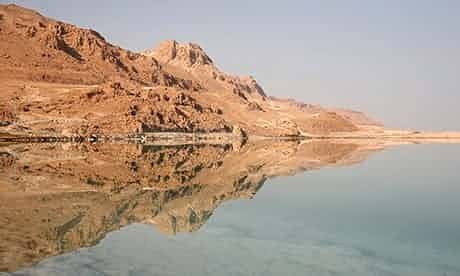 Environmentalists and scientists have also been strong opponents of the project arguing that the introduction of Red Sea water containing living organisms could have a catastrophic effect on the unique characteristics of the Dead Sea and affect salinity, evaporation rates as well as bacteria and algae composition (1, 4, 6). Some have warned against changes in sea levels which could result in surrounding properties and lands being immersed in water in both the occupied Palestinian territories and Jordan (3). Further, organisations such as FoEME and EcoPeace Middle East criticise the project for failing to address the root causes of the decline of the Dead Sea (2). Indeed, the main cause of the decline is the appropriation of more than 90 percent of water from the Jordan River, its main source of freshwater, to the north for agricultural and domestic use as well as mineral extraction by Israel, Syria and Jordan (1). The distribution of water in the region is a contentious issue, with most of the underground aquifers in the West Bank under Israeli control. Palestinians say they are severely deprived of water resources compared with Israeli settlements in the West Bank, whilst being denied access to the economic potential of the Dead Sea (1). The first stage of the project will start in the first quarter of 2018 and end in the last quarter of 2020. Companies have started to bid to implement and fund the first phase of the project. Project Details Under the agreement, 300 million cubic metres (10.6 billion cubic feet) of water will be pumped each year under the first phase. In its following phases, the Red-Dead project will see the transfer of up to 2 billion cubic metres of sea water from the Red Sea to the Dead Sea (3). Phase 1 involves the construction of a desalination plant with a capacity of 65-85 million cubic meters a year. Power plants will also be built along the pump line to produce 32 megawatt annually. Development of Alternatives EcoPeace Middle East has been calling on the World Bank to look into the current mismanagement of water resources in the region as the root cause for the demise of the Dead Sea. EcoPeace Middle East has proposed restoring the flow of water in the Jordan River, which has been dammed and diverted until only 10% of its former flow reaches the Dead Sea. To do this, they argue that the mineral industry should be charged for the Dead Sea water used to fill evaporation ponds, which yield minerals like potash and magnesium. (4) Can a controversial canal stop thousands of sinkholes from forming around the Dead Sea?